The finished leather jacket. This bespoke project from Gieves & Hawkes has progressed quite quickly compared to tailoring, but it still feels like an age since Davide and I first conceived of the idea. Most of all, there is the sudden, surprising impact of seeing it. Filled with nervousness; asking, do I like it? Yes, absolutely. The fit is great, the leather turned out well and I’m pleased with our overall choices on style. With each I had some concerns though. Let’s do each in turn. The fit to the body, shoulders, sleeves etc is perfect – for a tailored piece. But it feels strange as a blouson or short jacket because this is not how they are normally fitted. They are tight around the hips, with a buckle or couple of poppers to allow you to fit it snugly. The jacket then expands from there, comfortable it its roomy body. This jacket just ends at the hips. It is not tight, it is not snug; it just ends. I don’t think this looks strange from the outside, but it feels odd. Second, the leather. I was a little unsure of it when I first saw the jacket, but thankfully it is weathering well. It was a little too shiny when new, and the brown had a subtle pink cast. I’ve worn it a dozen times, rolled around in it a bit, been caught out in the rain once, and the jacket is better for it. There is some character to the hide already, with faint dappling from the rain, and the collar is no longer as precise. Third, the style. I was initially unsure of the decision to go without pockets. We even discussed the possibility of putting them on afterwards: cutting the leather and using excess hide to make the flaps. But the style is growing on me. The clean front is dressier, and I think it looks better with flannels, linen etc as a result. More details on the make later. 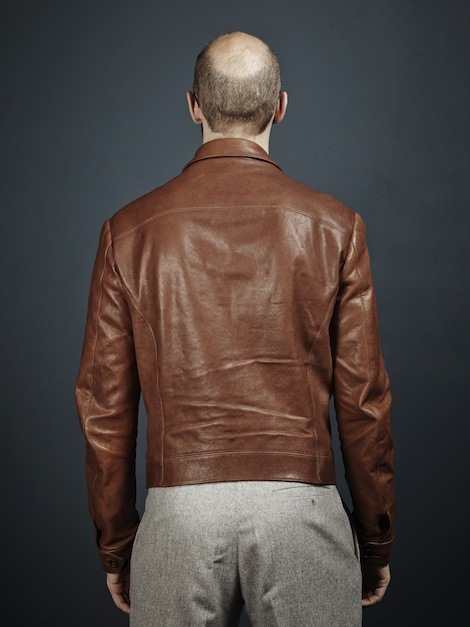 You can follow the discussion on The bespoke leather jacket: Part 5 by entering your email address in the box below. You will then receive an email every time a new comment is added. These will also contain a link to a page where you can stop the alerts, and remove all of your related data from the site. Perfect. Just perfect. Congratulations on your purchase. I’d do the same if I could. Firstly many compliments . It is a jacket that will show it’s true elegance and style as the leather ages . I didnt think i would but I do like the without pockets look. Is it possible you could give the cost of the items you have made? what a beautyful jacket! 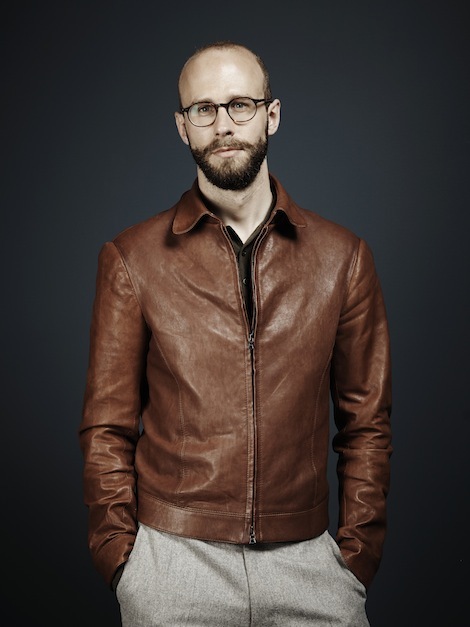 The leather has a great patina and the jacket looks totally cool, paired with these trousers. But how is the feeling of the jacket on the shoulders? It seems you could easily wear a jumper underneath – the rope is a bit down the shoulder line, especially from behind. But never the less, it is an outstanding piece! It’s a perfectly OK fitting jacket, but why go through the effort of making something bespoke when the end product looks like a generic article you could have gotten off the peg in a myriad of shops? There is nothing special about this jacket except for the fact that you commissioned it. The colour, the style, the details (or lack thereof) simply underscore the fact that there is nothing really special going on here. You could have saved a fortune going off the peg with alteratios (if needed). I take your point – there is less difference in the fit between this and a RTW version as there would be with bespoke tailoring. But there is far more than can come across in a few photos. As I mentioned, RTW leather never fits through the waist – it is tight at the hips and gives up on the waist. Altering jackets like this never looks good. I have tried on both leather and wool. You are altering the fundamentals of the shape too much. Also, alterations on leather are always tricky. It is hard to get right – I have tried two leather makers in London with mixed results. And, as I have also mentioned, if the jacket is aged at all (which all RTW versions are) then the alterations will create an odd look at the seams. So you can’t create this look with RTW. Whether it is worth the money is, of course, a personal choice. But I am at the stage where I have far too many suits, overcoats, shoes etc and I’m most interested and excited in exploring other bespoke options. What other items are you planning ? A closer look at MTM knitwear, some jeans Michael Browne at Chittleborough has made that I love, an overcoat made to fit over knitwear instead of a jacket, maybe a summer version of this jacket for next year… Oh, and trench coats. I’m very much looking forward to the MTM knitwear articles. I am a tall, slim-waisted, broad-shouldered man with obnoxiously long arms. I know knitwear can bear being a bit loose sometimes, but if even if I can get sleeves long enough the middle is usually floating around like a boat on the sea. I understand you were planning to write something for The Rake on Loro Piana MTM. Was that published? If so, which issue should I pick up? Yes, it can be frustrating. Knitwear will give, and can be adjusted slightly though wetting and a little stretching, but not enough often. The piece is in the current issue of The Rake I believe. Thank you. I’ll pick it up today. Really can’t see the point as the above poster points out in having a jacket like this made bespoke. Tailored jackets are different in that there is a big difference in internal structure which adds shape and more traditional clothes need to be fitted well at places like the shoulder to look elegant, but a leather jacket is such a casual piece of clothing that I can’t see how it would matter at all whether it was a bit more roomy through the body or not, or fitted well at the waist or not. As you mentioned trench coats above can you give some advice about them? Fitting and details i.e. That will have to wait until a bigger piece I think. But basically don’t bother getting any form of MTM or bespoke unless you are an outlandish size. For me, the cinching of the waist with the belt at the back is a style point and of course creates the desired fit at the waist. Thank you for the advice. I’m looking forward to read the post. Your blog is an enormus source of inspiration. I envy you having far too many (bespoke) suits, shoes and overcoats to need, or even wish for more… I’m just getting started, although with MTM, since bespoke is too much hassle for my present situation. 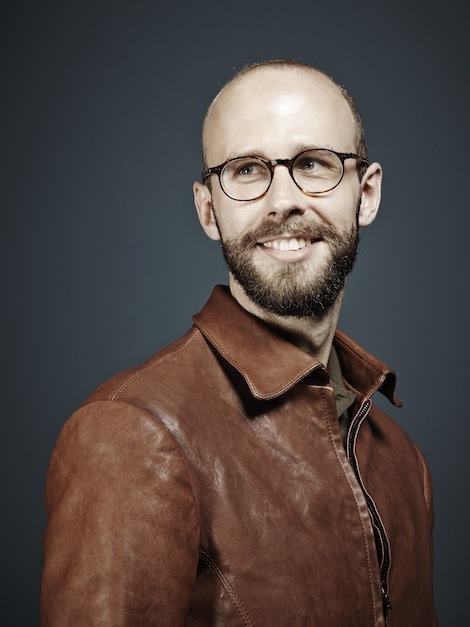 I like the result of the leather jacket, but am still far from oversupplied in suits, coats, shoes and shirts, so that amount of money would probably have gone to GG, EG and some tailors or MTM jackets. Following your advice I just bought some grey (and tobacco) flannels for the coming season. Now I just need a jacket, some shirts and accessories. And my dark oak GG cambridges arrived today :-)! Thanks. It’s a long process – even for someone with my connections and impetus to pump advertising money into commissions. Six years later and I feel I’m only now getting the biggest benefit of it all. Really fantastic result. The leather is lovely. Totally understand what you’re saying about the waist, it’s those details that are (one of aspect of) the difference between a bespoke and RTW garment. This is encouraging for me that the world of bespoke goes beyond formal suits and shoes. I really like this jacket Simon, more than I thought I would. Congratulations. Regarding your plans for future projects “A closer look at MTM knitwear, some jeans Michael Browne at Chittleborough has made that I love, an overcoat made to fit over knitwear instead of a jacket…”. Wow! You’re reading my mind. Those are probably my top 3 areas of interest at the moment. You also mention “I am at the stage where I have far too many .. overcoats … and I’m most interested and excited in exploring other bespoke options.”. You did a summary post a while back called something like “Tailors I have known” and most of the clothes shown were suits. Are most of those overcoats in your wardrobe bespoke? If so then one suggestion that I have for a future article would be a summary of your past experiences focussing on your overcoat/outerwear commissions. That’s a good idea Julian, though I only have two overcoats I wear really – both from Graham Browne, and one of them written about in detail (search for polo coat). The point of bespoke isn’t to be/look different to RTW. If anything, trying to make something markedly different to RTW options is probably best avoided. To me a bespoke (or even MTM) piece of clothing is like home made jam. Other people walking past you in the park watching you chomp on your homemade jam sandwiches and think nothing of it, but he who has seen the jam be produced, hand-picked the berries to go in it, decided on the amount of sugar to use etc… he is a man who experiences great pleasure with every mouthful. Knowing the provenance and manufacturing process (and having some input into it) elevates any item (foodstuff, clothing, furtniture) above the ordinary off the shelf options. Disclaimer: I usually dine off ready-meals and have mostly RTW items. PS great jacket Simon. That turned out really well. Very nicely done. That’s how I would want a leather jacket to look like too. I really like this project. It was neat to see how closely the finished jacket was to the pattern jacket. I also really like how the leather has a depth and already a sort of patina. Sometimes leather looks really flat so then the shape and fit have to carry the whole garment. My favorite part is the collar. I also love the sporty seams down the front and the fact it’s zippered vs buttoned. What’s cool about this particular project to me is that you have the sketches of the original idea (with you in the sketch!) and then also the remarkably well done photographs at the end. All of your bespoke suit extravaganzas, whether in London or Milan, have impressed. Clothes for a gentleman, carefully chosen, beautifully executed, and you look just marvellous in them. But I will never ever get my head around a bespoke leather jacket, or how you look in it, particularly when i think about that exquisite Savile Row suit £4,200 will secure. Man, I’d dearly love to know what G. Bruce Boyer’s take is on bespoke leather jackets….. But Mr. Boyer (I’d not dare refer to such an icon by his first, rather second, name) doesn’t actually address the bespoke aspect. And call me unimaginative, but it’s a bit of a stretch from G & H bespoke to WW2 bomber jacket, is it not? Anyway, I too have an old leather jacket; one I inherited in another life. Lining falling to bits, a patina of leather that i can only describe as heroically tired. But the industrial brass zip still works, well, if I’m prepared to fiddle with it for a minute or three. I keep it, and even sometimes wear it, only because my wife tells me I’m far too old to still be trying to nurture the James Dean look. The crosses we chaps have to bear…..
It’s just perfect. I would like to get one if I live in UK. Unfortunately I live in Asia cant afford such a long time to do fit down for a jacket. I enjoyed the process of watching the jacket progress and I have not a doubt that the feel of the material and the overall quality is exemplary. However it is not to my personal taste in style. It is more in my opinion a female style with the short back accentuating the backside. Furthermore the front is cut very much as stated in the cut of a shirt and I would have side pockets for practicality purposes. All in all a more vintage style. This jacket has a unique color texture more unlike from a normal brown jacket! I am going to commission a leather jacket. Would you suggest a bomber style collar or a stand up collar like the one you commissioned and why?